The Centers for Disease Control and Prevention (CDC), a component of the U.S. Department of Health and Human Services, is the primary federal agency that provides infection prevention and control guidance to health care settings. CDC guidance on infection prevention and control for dental settings provides the foundation for developing a site-specific infection prevention and control program. CDC is not a regulatory agency and uses terms such as “should” or “may”in its guidance documents. Some state departments of public health or state licensure boards have adopted CDC guidelines and recommendations as regulations for licensees and facilities that provide oral health services. In these states, words such as “may” would be interpreted as“must.” You should review your state-specific regulations. Even if not regulated in a state, CDC guidelines are the standard of care for infection prevention and control. 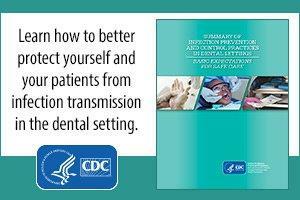 Provides basic infection prevention principles and recommendations for oral health care settings. Reaffirms standard precautions as the foundation for preventing transmission of infectious agents during patient care in all oral health care settings. Supplements existing CDC recommendations (the summary is not a replacement). Includes a two-part checklist (English and Spanish) to evaluate compliance with CDC recommendations. Provides links to the full 2003 guideline, other selected CDC recommendations published since 2003, and source documents that readers can reference for more detailed background and recommendations. Key infection control guidance and tools from CDC are the guidelines, the recommendations from the guidelines, the summary, and the checklist, listed below. Visit CDC’s website for a comprehensive list of resources. CDC’s DentalCheck app was developed directly from the checklist. You can use this app to periodically assess practices in your clinic and ensure you are meeting the minimum expectations for safe care. CDC encourages the infection prevention and safety coordinator and other staff trained in infection prevention to use this app at least annually to assess the status of their administrative policies and practices and also to engage in direct observation of staff and patient care practices. Checklist to acknowledge compliance with a list of administrative policies or observe practices. Summary of basic infection prevention principles and recommendations for oral health care settings. Ability to export results for records management. Links to full guidelines and source documents that users can reference for more detailed background and recommendations. Occupational Safety and Health Administration (OSHA), U.S. Department of Labor, holds regulatory oversight of workplace safety, as governed by the Occupational Safety and Health (OSH) Act of 1970. The OSH Act and related regulations from OSHA give employees a number of rights and impose several obligations and duties on employers to maintain a safe work environment. The OSH Act covers most private-sector employers and their workers, in addition to some public-sector employers and workers in the 50 states and certain territories and jurisdictions under federal authority. The law requires employers to provide their employees with safe and healthful workplaces, as is their right. The law also prohibits employers from retaliating against employees for exercising their rights under the law (including the right to raise a health and safety concern or report an injury). OSHA standards address exposure to several biological, chemical, environmental, physical, and psychological workplace hazards that may occur in the safety net dental clinic, but there is not a standard specific to dentistry. For example, OSHA’s standard on bloodborne pathogens and needlestick prevention is explained later in this section. OSHA’s brochure, Medical and Dental Office— A Guide to Compliance with OSHA Standards, lists frequently-found hazards and provides posters and other helpful resources. OSHA also provides resources to assess compliance with regulations specific to health care settings in its Compliance Assistance Quick Start: Health Care Industry. OSHA’s web page, Safety and Health Topics: Dentistry, is a discipline-specific portal that provides access to related standards and provides information about enforcement and hazard control. The United States Air Force (USAF) Dental Evaluation and Consultation Service (DECS) is charged to provide investigative guidance and assistance for all USAF oral health professionals. DECS provides clinical, laboratory, and consultation services for dental equipment, dental materials, dental facilities, infection control, occupational health and safety for the oral health team, and patient safety. The DECS website has a portal open to the public with many valuable resources. Two DECS resources useful in developing an infection prevention and control program include: (1) USAF Guidelines for Infection Prevention and Control in Dentistry, an infection prevention and control manual that integrates CDC guidelines and OSHA regulations and (2) Sample Exposure Control Plan. Organization for Safety, Asepsis and Prevention (OSAP) is a professional organization of clinicians, educators, researchers, and industry members who advocate for safe and infection-free delivery of oral health care services. OSAP focuses on strategies to improve compliance with safe practices and on building a strong network of recognized infection-control experts. OSAP offers an extensive online collection of resources, publications, FAQs, checklists, and toolkits that help oral health professionals deliver the safest oral health visit possible for their patients. In addition, online and live courses help advance all oral health team members' knowledge and skill. Many of OSAP’s resources are available to non-members. One example includes resources in non-traditional settings using portable and mobile oral health equipment. OSAP offers tools to help develop and implement an infection control and safety program and a list of questions that patients can ask about infection control in a dental setting. The American Dental Association (ADA) also has resources on infection control. 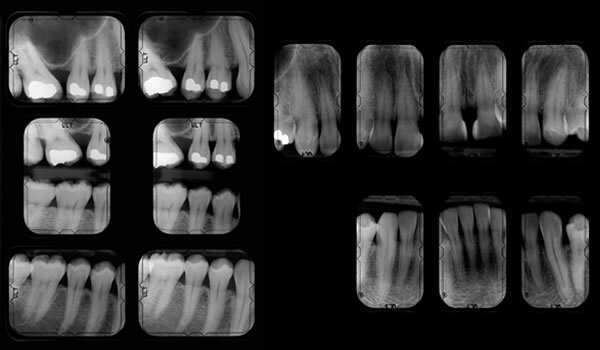 ADA urges all practicing dentists, dental auxiliaries, and dental laboratories to employ appropriate infection-control procedures as described in CDC guidelines and to keep up to date on scientific information about improvements in infection control, risk assessment, and disease management in oral health care.